Azure Striker Gunvolt 2 review: Like a Mega Man sequel! The first Azure Striker Gunvolt was a lovely little surprise on the Nintendo 3DS, and its positive reception even brought it to other platforms. This success brought developer Inti Creates praise and recognition around the handheld gaming world, and it put the small studio on a platform that it hadn't seen since it made the Mega Man Zero games for the Game Boy Advance. Inti Creates was all about hyping this first self-published game as a spiritual successor to its older hits, and it didn't even have to go through Capcom to put its ideas for an anime action game onto the market. This freedom allowed it to blast onto the indie scene and make a name for itself. Several years later, Inti Creates 'prestige has led it to become the programmer of several larger projects, but it's obvious where the studio's heart still lies. 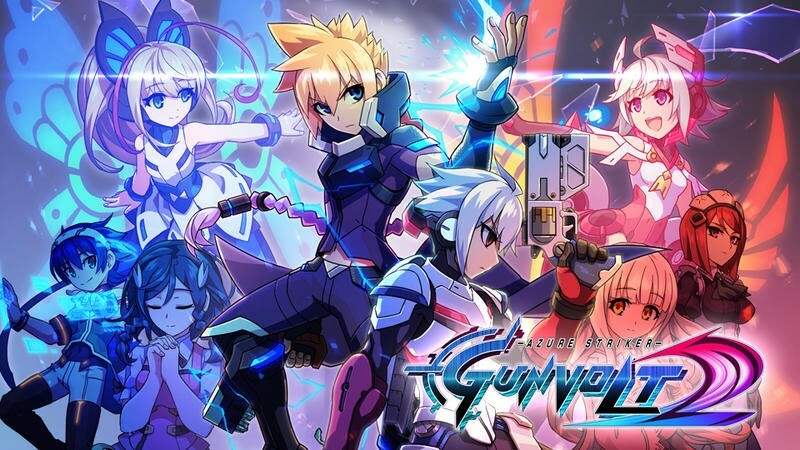 Azure Striker Gunvolt 2 is now a reality on the Nintendo 3DS, and Inti Creates shows that it is not only proud of its original property, it also listened to criticisms from the first time around. Those familiar with the original Gunvolt should already know main complaints against it. The brilliant and lightning fast combat is not quite enough to cover up the remedial level design. Inti Creates obviously knew what it took to make a fully functioning anime character leap from the screen and feel fantastic from the palm of your hands, but building a world around him was still something it needed work at. Enter this sequel and Inti Creates shows that it obviously listened to these criticisms. Azure Striker Gunvolt 2's platform placements show a lot more understanding of how to build exciting levels around a central character's abilities. Tight moments require precise timing with the heroes' gliding and jumping abilities, and others require smarter use of attacks, recognizing disappearing platform patterns. I wouldn't call Azure Striker Gunvolt 2's new approach to 2D action platforms perfect, but it clearly took off the training wheels and tried to get a little more risky with how these levels unfold. On the flip side though, boss fights don't quite hold up as much this time around. The final rumble alone is the only baddie that really provides a challenge, and each of the individual stage bosses hardly pose the same threat as the previous game's. Maybe it was the lack of damage they cause or the simplified dodging, but I easily blasted through them without even bothering to memorize their patterns. And that's a huge turn-off for a game that models itself after classic action games from the 2D era of gaming. A few additions to the combat allow Gunvolt to recharge his batteries at will and to dodge projectiles by standing still. Inti Creates totally does away with the "1up," system, meaning you get as many tries as you need when fighting bosses or tackling a tricky platforming section. Death doesn't really have much penalty this time around, but you might not even run into a game over to really notice until your fourth or fifth stage! If you're catching my tone, the biggest problem is that Inti Creates took off those training wheels and slapped them on the players. Azure Striker Gunvolt 2 is a much easier and shallower game than the first one and is ultimately less memorable for it. Even the customization options that held the previous game together like glue felt like an afterthought as I never changed Gunvolt's loadout even once! But Azure Striker Gunvolt 2 does add one important element that the first game did not have, and that's an entire second character. Copen is Gunvolt's very own "Zero," a side character who strides alongside the hero with his own storyline. Only, unlike Zero, Copen is somewhat a rival to Gunvolt, and the two do not get along at all! It is with these power-ups that the game comes closest to its Mega Man roots. Copen himself is a lot of fun to us, but those power-ups ring true to beating a robot master and stealing his power. As for the story, well, this too seems a bit more aimed at a younger audience. Gunvolt no longer belongs to a radical group of anti-government mercenaries. He instead hides out with a group of ladies, all of whom have the hots for him and constantly bicker over who likes him the best. This includes even his AI guardian angel, Joule. As for Copen, the emotionless grunt cares for a sick younger sister who just wants him to be happy. Beating bosses give him shards that he can use to secure her life essence as an AI, or something like that. These personal stories flesh out a plot about how robots and humans can't live together… Mega Man Zero all over again. What's baffling about the story presentation is that most of it is done during the gameplay! The boring cutscenes are delivered with text on still backgrounds, but the best drama unfolds while Gunvolt and Copen are blasting through the levels and duking it out with bosses. It adds a lot of tension to the action, but at the same time, unless you speak Japanese, you're not going to get much of it. Too much of your attention will be focused on bullets, enemies, level hazards, and boss patterns, and the subtitles at the bottom account for absolutely nothing since not a second of your time can be spared to read them! In fact, the character's portraits in the bottom left corner can even block the screen, hiding enemies and bosses from beyond the player's view, sometimes allowing them to get a cheap hit in! It might come across as blasphemy for such an anime inspired game, but an English VA track really would have been nice. I want to understand what's happening, but my eyes can't focus on both the subtitles and the intense action at the same time! Azure Striker Gunvolt 2 is a solid sophomore attempt in the series, but I think we'll need to wait for one more entry before Inti Creates really gets it perfect. For every issue it fixes, this sequel takes another step back, and ultimately, the novelty of the original's 2D graphics and action is no longer around to give it the extra boost it needs. Fans of the original will still like it though. There are hundreds of challenges waiting to be unlocked, power-ups galore to send these heroes into overdrive, and a whole new set of levels to perfect and earn that S-rank. It's a game that demands multiple playthroughs, and one alone for the story misses all the opportunities running through the levels. If only I hadn't gotten so many S-ranks on my very first playthrough, I would be inspired to go back and did through it more. Copen alone makes the price worth it in the end. His appearance brings vitality to this game similar to how Zero revitalized the Mega Man X series when he re-entered as a full character in Mega Man X4. It's a great game for speed-runners and those looking to memorize the ins and outs of old-school platforming stages. Plus, the barrier for entry is much smaller because it's an easier game. However, I found the first one more memorable in spite of its rudimentary platforming. I'd play that one first to find out what this series is all about. Then download this sequel as dessert, or at least a holdover until Inti Creates possibly reaches its full potential with the third game. Disclaimer: Nintendo provided us with a review copy of Azure Striker Gunvolt 2 for the Nintendo 3DS, and we played through the campaign before writing this review.